Trump's Tax Plan Has Echoes Of The Kansas Tax Cut Experiment Republican Gov. 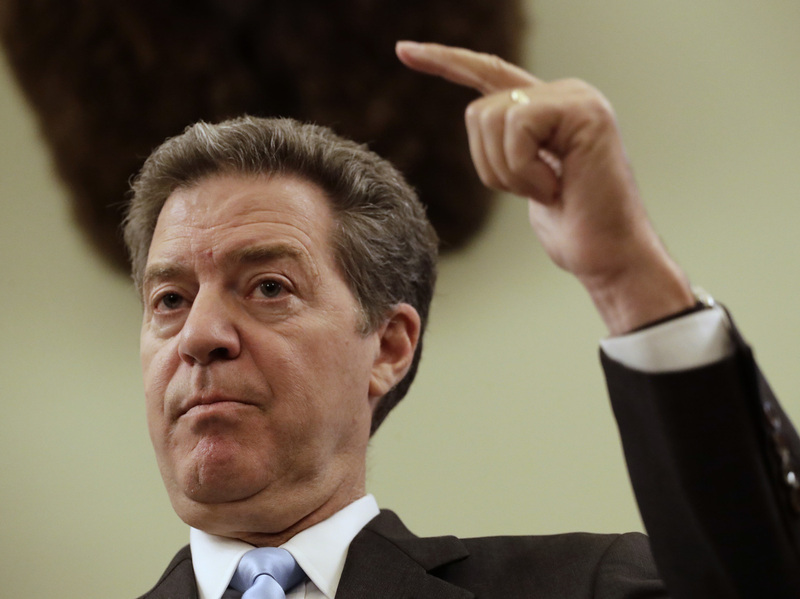 Sam Brownback said the 2012 tax cuts would deliver a "shot of adrenaline" to the state's economy. Instead, revenues crashed, spending cuts, borrowing and accounting tricks followed. Kansas Gov. Sam Brownback talks to the media during a news conference in July. Members of Congress might want to familiarize themselves with the story of Kansas' failed tax-cutting experiment as they begin deliberations on President Donald Trump's tax-reform plan. It could serve as a cautionary tale because some elements of the president's updated proposal mirror pieces of the tax-cut plan that Republican Gov. Sam Brownback pushed through the state legislature in 2012, promising it would deliver a "shot of adrenaline" to the Kansas economy. It didn't. Instead, revenues crashed, forcing Brownback and lawmakers to resort to spending cuts, borrowing and accounting tricks to maintain a balanced budget. So, Kansans reading headlines about the Trump tax cuts might be excused for having a déjà vu moment. "Are you kidding me," says University of Kansas political scientist Burdett Loomis. "I think it is pretty clear that the Kansas experiment was a failure." William Gale of the centrist Brookings Institution called the Kansas tax cuts "a lab test for how supply side tax cuts may work at the federal level." Not well, he concluded in a July blog post. "The Brownback plan aimed to boost the Kansas economy, but instead led to sluggish growth, lower than expected revenues and brutal cuts to government programs," Gale wrote. In his self-described "red-state experiment," Brownback, who's been nominated for a State Department post with the Trump Administration, slashed individual income tax rates and lowered to zero the tax on so-called pass-through business income, which usually comes from small businesses and partnerships. In Kansas, some business owners responded by restructuring their companies as limited liability corporations to avoid paying income taxes. State revenues plummeted by hundreds of millions of dollars and continued to miss projections for several years. Like Brownback, Trump and GOP congressional leaders say lowering income and business taxes will spur investment and economic growth. Their plan would reduce the nation's top income tax rate to 35 percent from 39.6 percent and lower the corporate tax to 20 percent from the current 35 percent. Unlike the Kansas experiment, the president's proposal wouldn't exempt pass-through income but it would lower the rate that high-earning professionals in business partnerships pay to 25 percent. "The promise [in Kansas] was that the tax cuts would generate so much economic growth that you wouldn't really feel the revenue loss," said Michael Leachman, director of state fiscal research at the liberal Center on Budget and Policy Priorities, said. "The same sorts of promises are now being made at the federal level." With state revenues in free fall, Brownback rejected calls to roll back parts of his signature tax cuts. Instead, he slashed university budgets, cancelled highway projects and convinced reluctant lawmakers to go along with a plan to borrow $1 billion to shore up the state's public pension fund. Angry voters responded in 2016 by ousting dozens of conservative Republicans who supported the tax cuts and replacing them with Democrats and moderate Republicans who promised to "fix the mess" in Topeka. Led by a coalition of those newly elected lawmakers, the 2017 legislature ended the Brownback experiment by passing a $1.2 billion tax increase over his veto. State Rep. Melissa Rooker, a moderate Republican who helped lead the rollback effort, took little satisfaction in the victory. "It's hard to celebrate because Kansas in such shambles," Rooker said to the Wichita Eagle. "The magnitude of the problems that we have to correct is so great." The failure of the state's tax-cutting experiment hasn't dampened enthusiasm for Trump's tax-reform proposal among Kansas' all-Republican congressional delegation. All five of the state's U.S. House members and both of its U.S. Senators have expressed support the president's plan. Statements posted to their websites this week make little mention of the array of proposed cuts for wealthy taxpayers. Instead, they tout the plan as a long-waited effort to simplify the tax code and deliver relief to middle-income Americans. "Many Kansas families are living paycheck to paycheck and need tax relief," said GOP Sen. Pat Roberts. Congressman Roger Marshall, a first-term Republican whose district covers two-thirds of the state, said he "could not be more excited" to support the plan. "This fairer, simpler system will be a huge relief for the working and middle class," Marshall said, citing the proposal to double the standard deduction as an example.